I watched Bill Moyers on PBS last night and was amazed/disturbed that the media giants had failed to report the anti-war marches that took place last weekend. Several major U.S. cities were host to huge protests. No one told me about them. Bill Moyers also reported on the newest FCC moves to further erode fairness and competition. By mid-December Federal rules may be changed to allow the big 6 media conglomerates to continue to purchase/create media monopolies in most major markets. This battle was fought and won 3 years ago. Once again, a Bushie wants to please the big corporations at the expense of the people and we need to fight it, again. Will the Democrats make a fuss? I am reminded of the consternation that both Bill and I felt in the Spring of 2002. We were in London, England over the Easter Holidays and came upon a huge street protest. 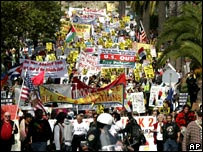 The march featured signs saying "No War for Oil", "No War in Iraq", and various anti-Bush slogans. We were perplexed and embarrassed. What war? What the Hell were they shouting about? The drumbeats of war had yet to begin in the United States. It was September, 2002 before Americans were being "sold" on the need to go into Iraq. The international media and it seems the rest of Europe knew we were heading for war. As someone that pays attention to the news, I was angry. Angry that we in the United States were uninformed and/or misinformed by the media. I was more skeptical about the coming war due to the Piccadilly Circus protest encounter. And, like many Americans, when General Powers and others warned us about mushroom clouds I grudgingly conceded that we should go to war. Assholes. We are not being served well by the "mainstream" media. Read. Read. Read. Read Blogs, news sites, foreign news sites, and more. We must be vigilant. Clear Channel, Fox, and it seems even CNN and MSNBC cannot be trusted. "Trust, but verify," said Ronald Reagan. Words to live by.